We’d love your help. Let us know what’s wrong with this preview of Prodigal / Riven by Sherry D. Ficklin. To ask other readers questions about Prodigal / Riven, please sign up. Prodigal is the second book in The Lost Imperials series. Stein, abducted as a child, has no recollection of her life before the hollows until she discovers a journal with information that will forever alter her. After discovering her life, her friends, and everything she thought she knew is a farce, she finds out that she has a genetic mutation that is slowly killing her. The one person who can help her is her mortal enemy. How will she trust the one person she swore she never would? This steampunk novel by Ficklin and Jolley is a wondrous and fascinating adventure. From the incredible world building to the incredibly fierce heroine, this book was a fantastic read. The world building in this novel is almost indescribable. It really has to be read in order to be completely understood. It is like taking scifi and futuristic, historical and steampunk and mixing them all together, which I wouldn’t think would be possible; however, this novel proves otherwise. The heroine, Stein, is a force to be reckoned with. She is tough, smart, and wittingly sarcastic. She is what every girl wants in a strong female lead. The writing in this novel is incredible and intense. The book is well-paced and intriguing from start to finish. Lucky for us they released both book two and three together because after an ending like that awaiting the third book would be utter agony! Riven is book three in The Lost Imperials series. Ethan is a Rifter on a fairly routine mission, when things become anything but routine. He finds himself in an unimaginable predicament and having to rely on a person he barley knows to save him. He is also forced to face with his dark past, and the toughest decision of his life: to become a guardian and leave everyone he has ever loved or allow all he holds dear to meet a dark future. The characters (and there are quite a few) are pretty much amazing. They have a certain chemistry about them which only comes with true friendships. It was a breath of fresh air in an intense story. In this installment the authors allow the reader to really delve into Ethan’s past and get to know him. The writing in this novel was just as awe-inspiring as in its predecessor. The world building was fantastical and will immerse the readers in places they never imagined. The book is well-paced and full of adventure. The book does, however, leave the reader with a boat load of unanswered questions. Also, the unfortunate part is that the fourth book wasn’t also released with these two because the ending is cliffhanger. Jolley and Ficklin have a serious knack for endings that induce agony upon their readers. This is my book, so of course I love it and I hope you do too! Thanks for taking the time to check out Prodigal & Riven! Of course I love it, I co-wrote it with Sherry D. Ficklin! I hope you enjoy reading it as much as we did writing it. My book, so of course I love it. Hope you do too! I was given the ebooks for Prodigal and Riven in exchange for an honest review. 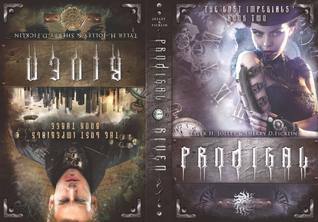 Prodigal and Riven are the second and third books in the Lost Imperials Series. I loved the first book, Extracted. It's focus was on brother and sister, Lex and Ember. Prodigal focuses on Stein, Lex's girlfriend and her story, while Riven focuses on Ethan, Ember's boyfriend. It's so great seeing the backstories of the other lead characters from the first book while seeing the continuation of their stories. Everything I was given the ebooks for Prodigal and Riven in exchange for an honest review. Prodigal and Riven are the second and third books in the Lost Imperials Series. I loved the first book, Extracted. It's focus was on brother and sister, Lex and Ember. Prodigal focuses on Stein, Lex's girlfriend and her story, while Riven focuses on Ethan, Ember's boyfriend. It's so great seeing the backstories of the other lead characters from the first book while seeing the continuation of their stories. Everything fits together so perfectly in the story lines and in looking back at all three books, you can see little clues left along the way. I really liked Stein from Extracted, so I was excited to get to read an early copy of this book. Without giving spoilers (and I'm finding that really tough with this book) I'll say that learning more about Stein and where she came from was really fun. There were twists and things I didn't see coming, and all the time, Stein is that character I loved in book one. The one who is tough, wants answers, and is pretty much caught between two groups. And the ending! Ugh, it's killing me not to talk about it because the ending alone makes this book worth the read. I'll be jumping immediately into Riven to see what happens next.